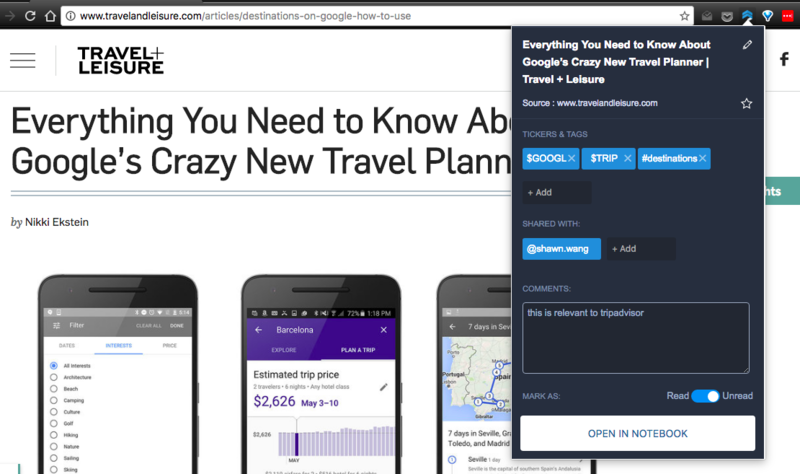 $GOOGL Trips Goes Native: When will $AMZN buy $TRIP? We have spent the past day playing around with the new Google Trips native app. Reviews have been effusive, with titles like “killer travel app” (The Verge) and “a free, full-time travel guide” (TechRadar). The user interface is a breath of fresh air and matches the clean aesthetic we’ve come to know and love from Google, but it doesn’t make us run out and short TripAdvisor right away. Unlike the Chinese OTA sector, where the two industry leaders $QUNR and $CTRP literally threw billions at each other before finally making peace, the Western “TripAdvice” industry is bifurcating and this is the reason why $GOOGL and $TRIP will coexist peacefully in the medium term. In the long term, $TRIP will probably not exist as an independent entity. We explore why it could be worth more to $AMZN instead. Let’s say it right off the bat: Google has never gotten social right. But given the runaway success of Google Maps and its core advertising business, one would think that the OTA business is a much closer adjacency that Google has the wherewithal to tackle. Of course, doing targeted research on this isn’t going to work well with traditional tools given Google’s massive scale and other businesses. 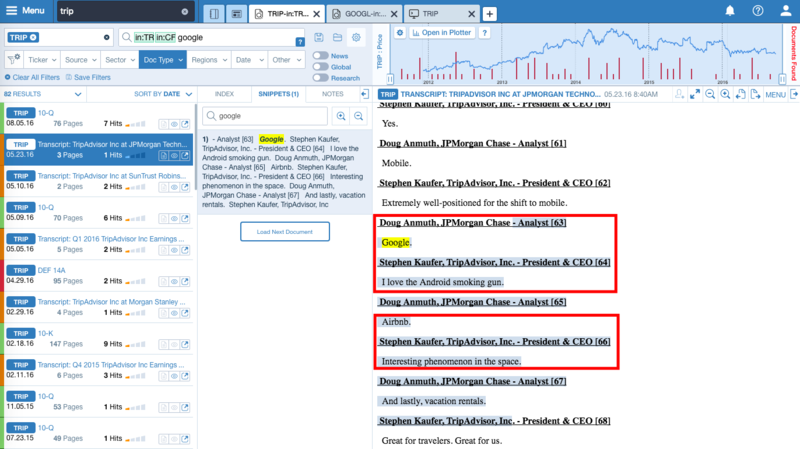 Using Sentieo’s Chrome and Mobile Web Clipper, we can gather the datapoints we need to build a historical picture. But we figure that it simply took the world that long for offline data syncing to reach a level where it had an obvious product-market fit with travel, where data is often extremely expensive (if not entirely unavailable) and is most needed. We think where the industry shakes out in the medium term is a sort of uneasy coexistence between OTAs (like $TRIP) and Google. Each have very different strengths. Google has superior Maps and integration into Google Calendar and Gmail, with its >1bn MAUs, not to mention a preexisting advertising customer base with technology to serve them. 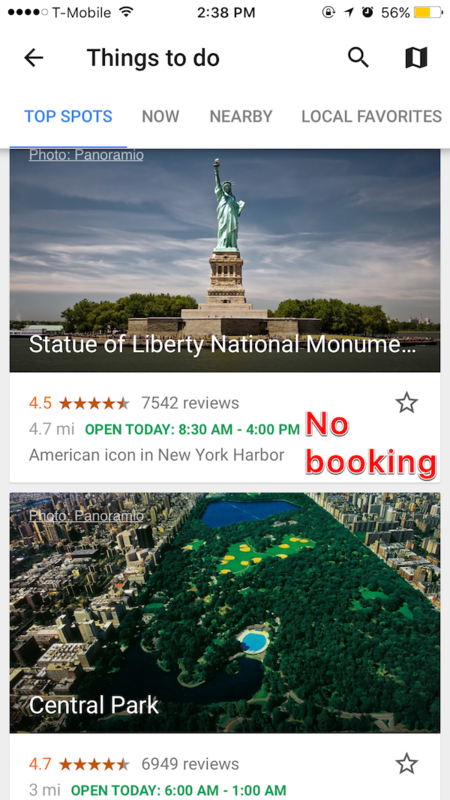 TripAdvisor has a community and a wealth of reviews that Google is still inexplicably terrible at producing and distributing, particularly on organized tours. There are feature differences (Google is now far and away the best offline product on the mobile market) but those will close given time. This difference targets the two apps toward very different audiences. One we shall call the DIY-ers, who do their own research, like to arrange their own trips and plot their own routes and are already on the rest of the Google ecosystem. They are mainly but not exclusively millennial, like to experience the location “like a local,” and actively avoid doing overly “touristy” things like waiting for hours to get on giant ferris wheels. The other audience we can call the Tourists. They expect a certain level of comfort and like to avoid stress on their holidays. They take more traditional vacations and don’t mind paying a little extra for a smoother experience. We all know people of both types. Amazon In The Long Run? We now indulge in some wild speculation, emboldened by the pace of change seen during this year alone. We suspect TripAdvisor cannot maintain its present relevance by staying independent in the long term. 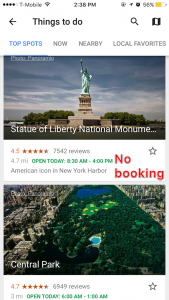 Like many “incumbents” before it, TripAdvisor will fall victim to aggregation theory: when AirBnB launches its own Trips app and has a better hold on the global community, when Uber owns self-flying planes, when Google owns the customer in Maps and Mail, then suppliers of travel experiences from attractions to hotels to flights to restaurants will flock to where the users are. 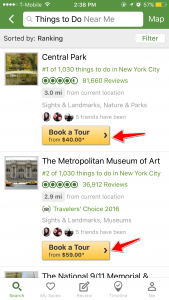 TripAdvisor has never owned the customer relationship from “End to End,” as it likes to tout in its public filings. 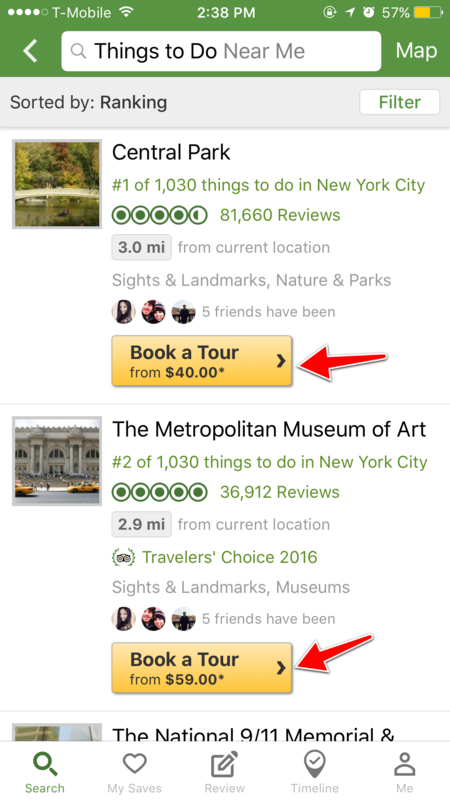 When we consider the future of platforms and contemplate the growth focus shifting from mobile to Voice/VR/AR, TripAdvisor will be hopelessly behind in reaching the customer directly. 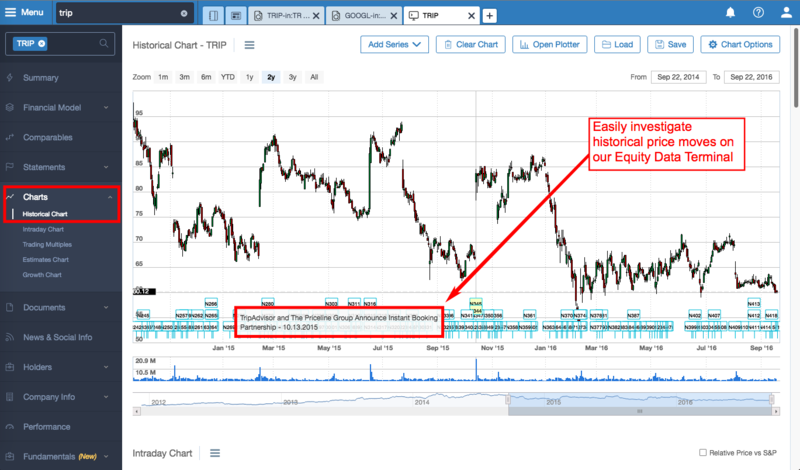 Aside from a consolidation play with PCLN/EXPE, which merely kicks the can further down the road, what vertical giants can it partner up with, if not Google? We know that Facebook has other interests in mind, and Apple’s attention is best spent on hardware (and services directly relating to its hardware). We think, surveying the field, that Amazon is actually a more likely home for TripAdvisor. As evidenced by its recent forays into fashion and cars, the company sees no limits to being the one stop shop for buying anything online. Their in-house attempt at owning travel, Amazon Destinations, recently failed and was shut down due to a complete lack of traction. This means they might be ready to buy vs build. We see three key synergies here: 1) Prime memberships getting to go global is an easy sell. People need to buy things while they are traveling too. 2) Alexa instantly gets native travel advice to compete with Google Home, launching in early October. 3) TripAdvisor’s experience in managing a reviews community would be additive and improved with Amazon’s experience and vast customer base.